Seasonal design and production of statistical data for FIS, who supplied local and national newspapers, football clubs and printing groups throughout England and Scotland. 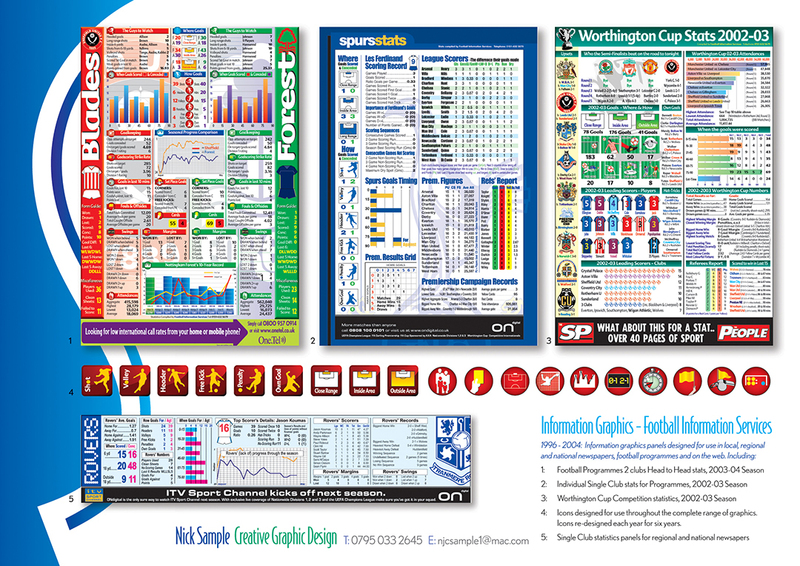 Fresh new designs and layouts were produced each season, and by 2000-2001 the company had become recognised as the premier supplier of statistics to the football industry, outlasting several other (larger) organisations who offered a similar service. Nick's input included the original design of all graphic icons used throughout the pages, the creation of sponsorship and sales documents that were distributed nationwide, and the origination of numerous teams' logos, many of which were subsequently adopted by the clubs themselves. Nick also collated and produced the statistical information for both the F.A. and Worthington Cup competitions between 1997-98 until 2001-02.